Relevant project experience gathered in the EU-project JEM! 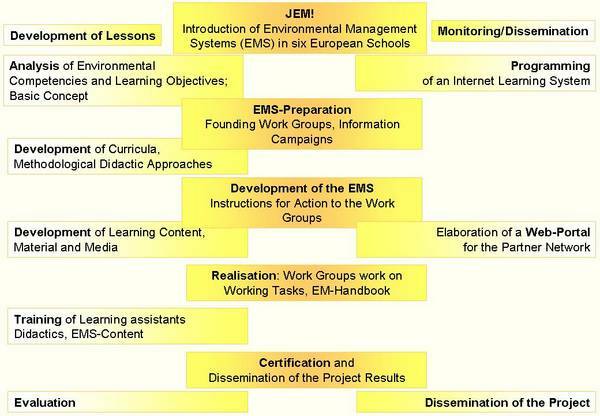 CLIMES builds on the experience gathered in the EU-funded project JEM! - Joint Environmental Management (2005-2007). The project JEM! aimed at raising sustainably awareness about environmental issues among young people in six regional European school networks by introducing an environmental management system according to EMAS (Eco-Management and Audit Scheme). The project JEM! was based on the idea to develop a new and attractive concept of schools and education by focussing on a topic which was relatively new in school education at that time - environmental protection. In this context the introduction of an environmental management system in the partner schools was in the centre of the project. For this purpose training concepts and learning materials were developed and "environmental officers" in the partners schools were trained in the framework of a European workshop. The success of the JEM! lied above all in the fact that it was the students themselves, who, as environmental management group members, developed and implemented the environmental management system together with their teachers in their schools.